Teotihuacan is located near Mexico City. It is an ancient city built by the Teotihuacanos, at least this is what we are told when we visit. Teotihuacanos predated the Toltecs,Mayans, Aztecs. This is about all that is known besides their average height was 6’6″. The reality is that it is known that 1300 years ago, the city began to be abandoned by the late residents in that time period, which were not the original builders. Some “Mexica’s” remained as it provided shelter and a safe place. The reality still remains that we do not know much about who exactly built it. 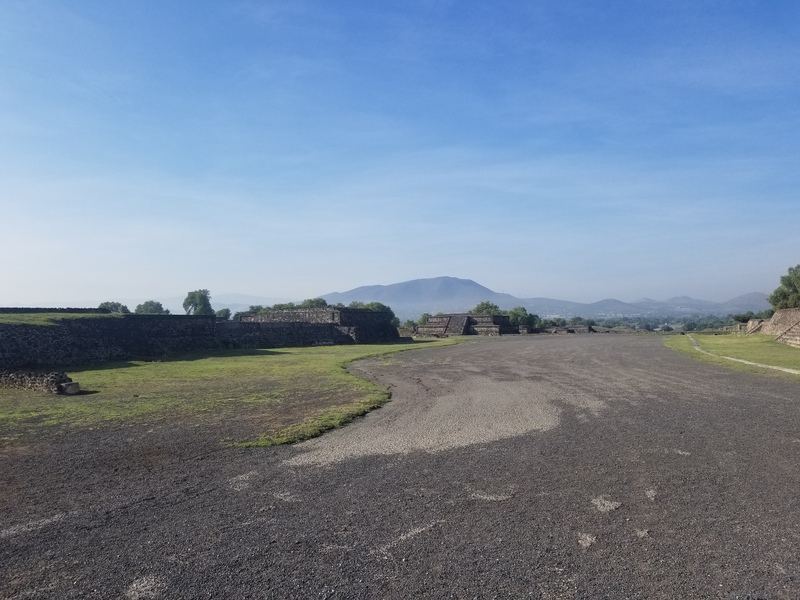 We only know part of its history from the cultures that occupied it after it was abandoned by its creators, which the locals claim are the Teotihuacanos. Recently, while on a trip to Mexico I had the opportunity to visit this incredible place. I have read plenty about the city, seen programs that make incredible claims, and now i have been able to climb it and experience it for myself. I am a firm believer that there have been many civilizations before ours. Some advanced, and some not so advanced. If you were to document the timeline of the Earth with a tape measure, it would expand to more than 11 feet, with 1 mm of it being how long our known human history is. This means that we don’t quite know much about our existence, our history, or even how many previous cultures existed before ours. This visit took place earlier this year (2018). I arrived just after 9am on a Thursday. Upon arriving we are presented with the most spectacular view of the largest building, the temple of the Sun. 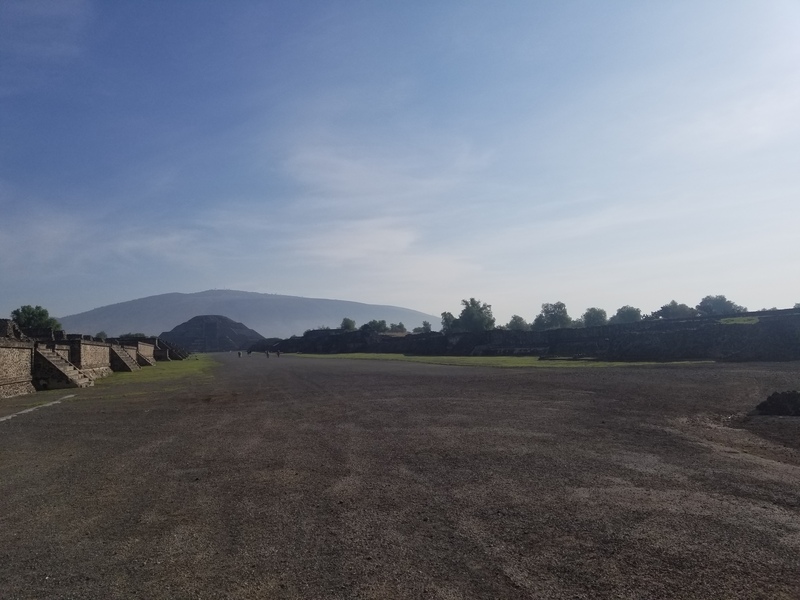 The initial view one is presented with when visiting the site of Teotihuacan. This is the biggest pyramid on the site, known as the pyramid of the Sun. At this point in our arrival i can say that whomever built it wanted to convey their power, and they certainly got the message through, loud and clear. This is one of the most impressive, and majestic sights i have ever seen. It certainly was meant to make anyone that stumbles upon it feel small, and understand that its creators were the great ones. The pyramid of the sun is just over 300 feet tall, with one of the largest pyramid bases in the world. As soon as you cross the area in the image above, you are immediately met with what the later occupants called the “Road of the Dead”. Supposedly this road that connects all the structures, was used by the later occupants of the city as means for trade. At least this is what it is stated by the local experts. The above image is looking at the pyramid of the Moon, which is to the left of the pyramid of the Sun. The pyramid of the moon is the second massive structure at this site, and sits at the end of the Road of the Dead. At this point in my visit. When i first saw the Road of the Dead, all i could think about was, that it was the last sight that many saw before being executed to please the Gods of the occupants of the city, which of course were not the original builders. As we crossed the Road of the Dead, we approach the massive pyramid. At this point we were advised by the locals, several things. First, do not walk a straight line up the pyramid. Doing so, would very well bring you dishonor, and it is considered a bad omen brought upon one by its ancient builders. Ironically, we can only speculate about its creators, whom the locals call the Teotihuacanos. 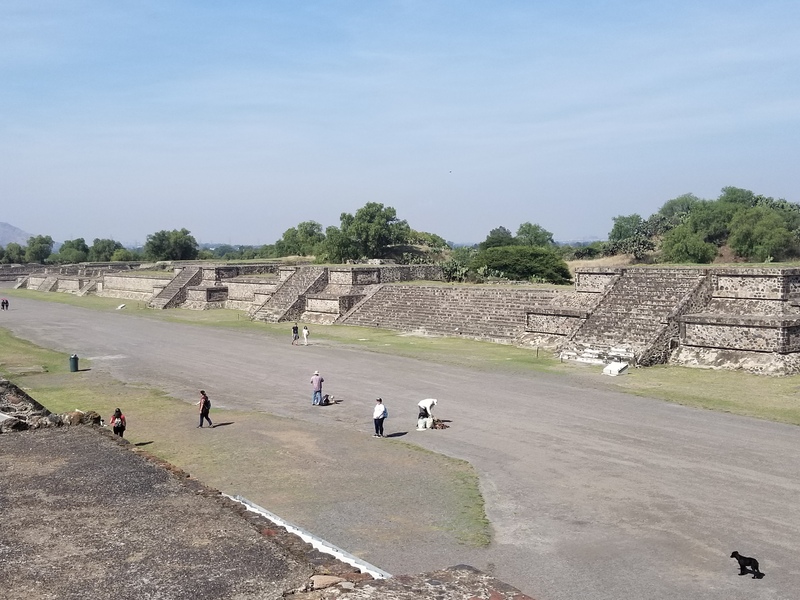 Scholars speculates on who actually built it, but make no mistake… we honestly only know that their average height was 6ft 6 inches, and this claim is based on the little know about the Teotihuacanos, as well as the fact that in order to walk up the steps comfortably you’d need to be 6’6″. It is only when the conquistadors arrived, and the gene pool became mixed, that the average height of the local population began to shrink. At this point in time, the average height of folks in the area is 5’7″. While standing in front of the pyramid of the Sun, looking right on the Road of the Dead. About a quarter mile from this position behind the mound on the center of the picture is where Archeologists recently found a secret tunnel in which a river of mercury was found along with offerings made by the residents in ancient times. This discovery is as recent as mid 2017. As we move towards the pyramid of the Sun after crossing the Road of the Dead, we finally realize how massive this pyramid really is. 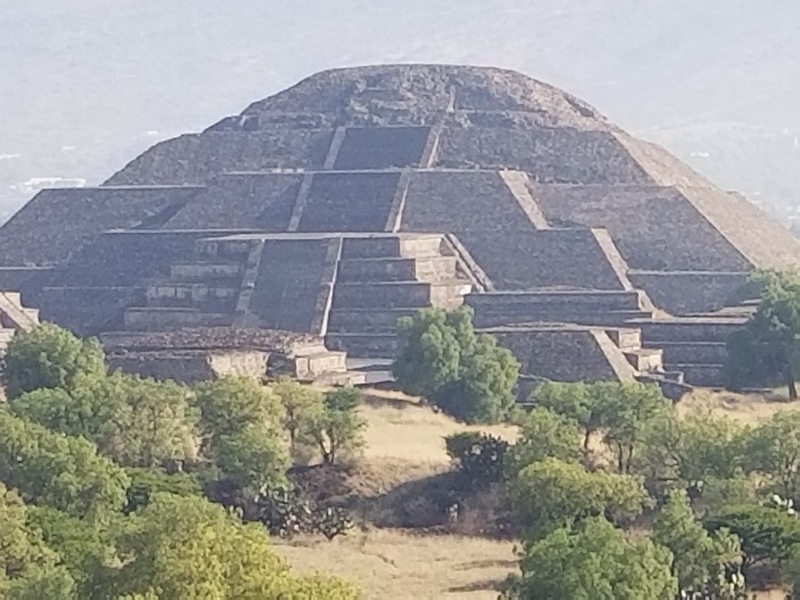 As i approached the pyramid, all i could think about is, don’t walk up in a straight line, and make sure to walk up in a diagonal zig zagging back and forth. Walking up the pyramid in this fashion is scary in the sense that by doing this you have nothing to hold on to, and difficult because it surely makes this arduous climb even harder. The other reason why it is scary is that many folks do not follow this request by the locals to walk up the pyramid in a zig zag fashion, so going up properly can be a hazard on a busy day. When i was there, we arrived early enough to not have many visitors climbing up, but it is easy to imagine this steep, exhausting climb in a busy season. There are many safety warnings around, and many tourists who have ignored these warnings have suffered. This is the view once you cross the Road of the Dead. It is an area that was clearly designed to provide a worship spot, or a spot to pay homage to their Gods. The sight is absolutely majestic. As we climb up, we begin to feel the effects of the altitude. Although the pyramid itself is only about 280ft-300ft, the city of Mexico itself sits at a much higher altitude, somewhere around 6,000ft. For a group of guys that are mainly accustomed to sea level, this altitude provides additional fatigue when climbing it. The climb is slow, arduous, and one must remember to maintain a zig zag direction while climbing it. Even though we do not believe in curses, we looked at this request as a means of being respectful to the locals, and we always want to be respectful to the locals. 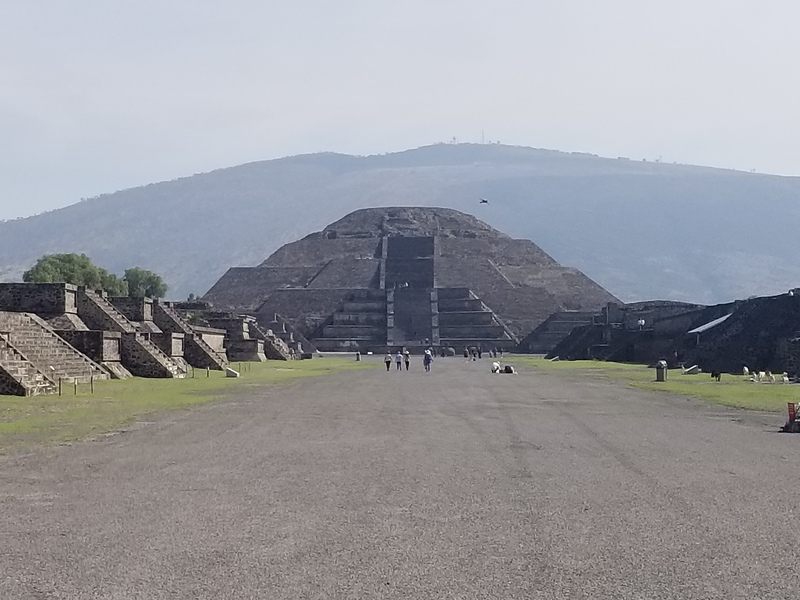 The image above was taken just above the first flat level of the pyramid of the Sun overseeing the Road of the Dead, in the direction of the pyramid of the Moon. While climbing the pyramid of the Sun, i thought often about how much easier it would be if I was 6’6″. 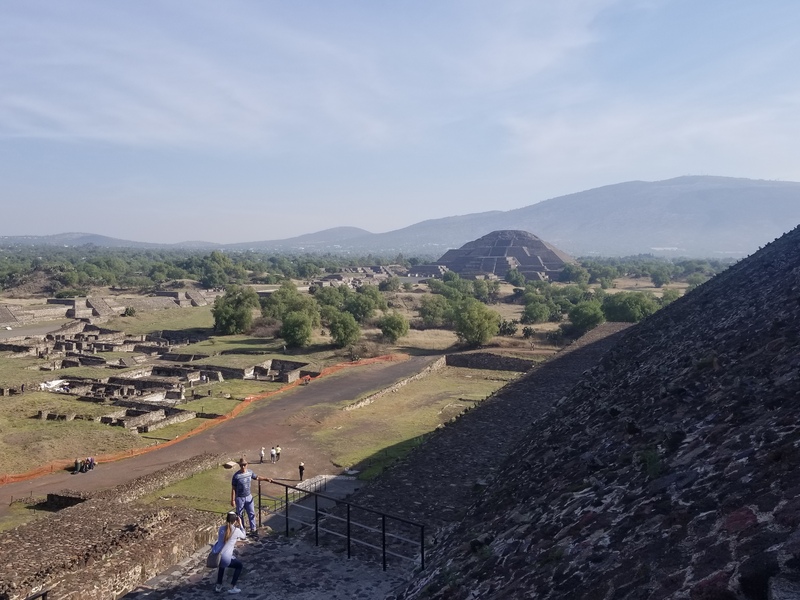 This was interesting in the sense that once we got down from this pyramid, and i had a chance to speak with some of the archeologists that where on site, they confirmed that the Teotihuacanos had an average height of 6ft 6″ inches. This was a fascinating statement as it is something i had not came across before in all the readings i have done about the different cultures in Central, and Latin America. Considering little is known about the Teotihuacanos, i find the fact of their details fascinating. I am also certain that i will definitely inmerse myself into learning all about those known as the Teotihuacanos. 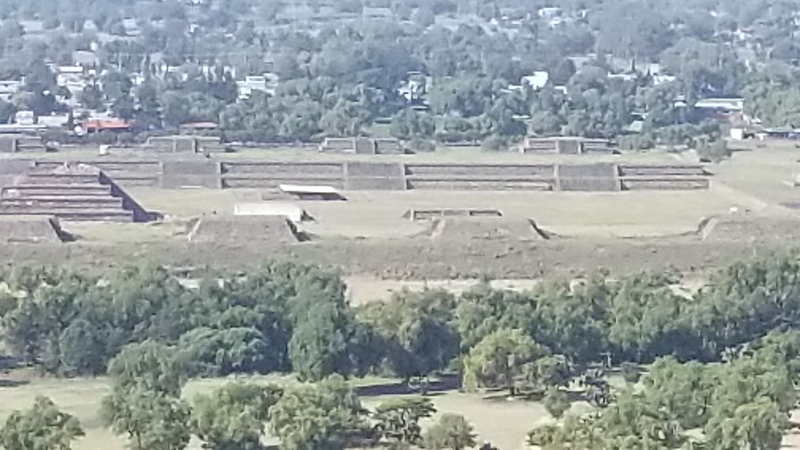 Zoomed in on the pyramid of the Moon from half way up the pyramid of the Sun. Once at the top of the pyramid of the Sun, the mood changes. It is said by the locals that when you reach the top, to bring a piece of jewelry, or a meaningful amulet that you would like blessed with the energy of the pyramid. The feel is different, not sure if it is all the iron they used to build the pyramids or just the incredible size of it. Once up top, there is a feeling of peace, calmness, and a slight breeze that adds to the calming sensation. 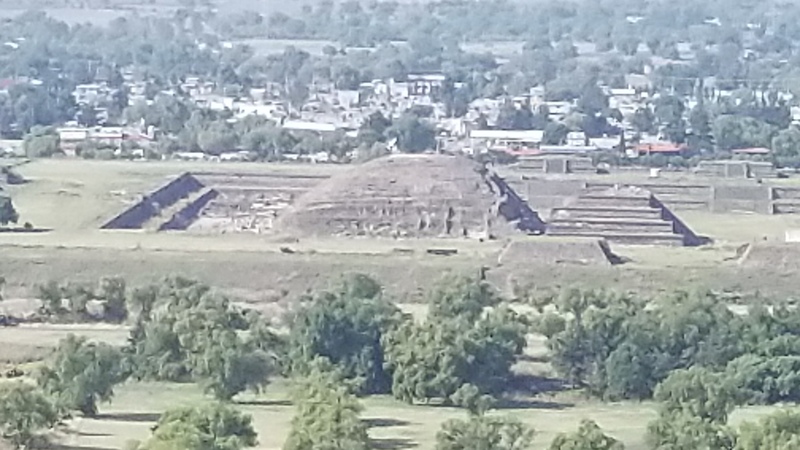 Looking in the direction of the pyramid of the Moon from the very top of the pyramid of the Sun. Notice all the iron ore in the picture. The view from the top of the pyramid is breath-taking. The valley in which the city of Teotihuacan lies, is surrounded by mountains. These mountains are also considered holy by the locals, and this belief goes as far as the tales of the residents that came after the builders. It is also suspected by archeologists; although not proven, that some of those mountains may be pyramids waiting to be found. Many artifacts, have been discovered from the previous inhabitants in these mountains. However, if they are pyramids, this still is yet to be proven. 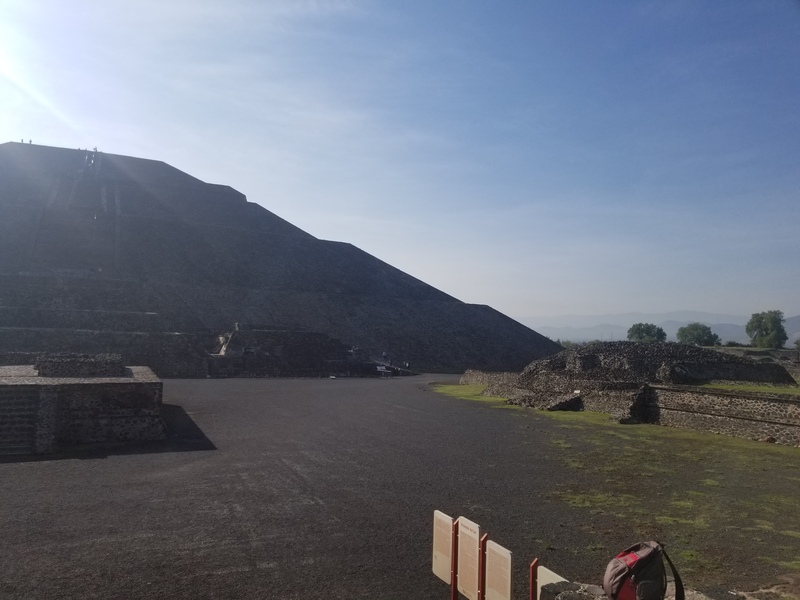 As we sit on top of the pyramid of the Sun, i begin asking the locals about the recent discovery of the underground tunnel filled with Mercury. For those of you that have not heard about this, here is the brief scoop on this underground river of mercury. For many ancient civilizations, minerals, and other things that provided a reflection of one-self meant that it was a portal to another dimension. In the case of the builders of Teotihuacan, and later residents of the city it meant exactly that, a passage to the underworld. In these tunnels they would bring offerings, and worship their gods in order to be able to make a good transition into the after-life. This recent discovery (about a year ago from when this article was written), was actually not found at the foot of the pyramids as many un-named tv shows, and documentaries claim. The discovery is a bit more elusive than this. It was actually discovered in a different part of the site, and it is speculated to lead under both pyramids. This archeological dig is a very tough dig, in the sense that they still have not reach the end of the tunnel according to the locals, and according to the archeologists it will be a while before they reach its end. It is interesting to note, that Mercury is not commonly found in this form nearby. So it becomes a bit more interesting when one imagines how this mineral was brought to the area. I asked the archeologist that I spoke to (whom will remain un-named) if we could get a tour of that area. I was willing to offer him many dollars to get this tour, however it is completely closed to the public. The image below is the actual entrance to the tunnels, and also the entrance to the archological dig. It was surprising to find out that it is not were many sources point it to be. This is the area that the local workers, and the archeologist working on the site indicated that the underground river of mercury was discovered. The area indicated actually resides almost a quarter of a mile from the pyramid of the Sun. This was surprising since the TV shows that documented this discovery indicated that it was found at the foot of each pyramid. I was told that the river is suspected to lead under each pyramid but there is no confirmation at the moment for this. It was explained that the tunnels did in fact have remains of offerings made by the residents (unclear if it was the pyramid builders or occupiers that came well after the pyramids construction). Unfortunately, i did not get the chance to document it, and i am only able to relay what was told to me during my visit. I was also told that traces of mercury were found in the ondulation where the entrance was found during the dig. This is interesting in the sense that it could mean one of two different things. First, it could be traces of mercury spilled while filling up the river; and this would be assuming the mercury was brought in from elsewhere. Secondly, it could mean that the area surrounding the entrance could have been filled to the top at some point in history. Again, both of these statements are current speculations communicated to me by the archeologist I met with. This is a view to the right of the previous image of the area where the entrance to the tunnel that leads to the underground river of mercury was found. 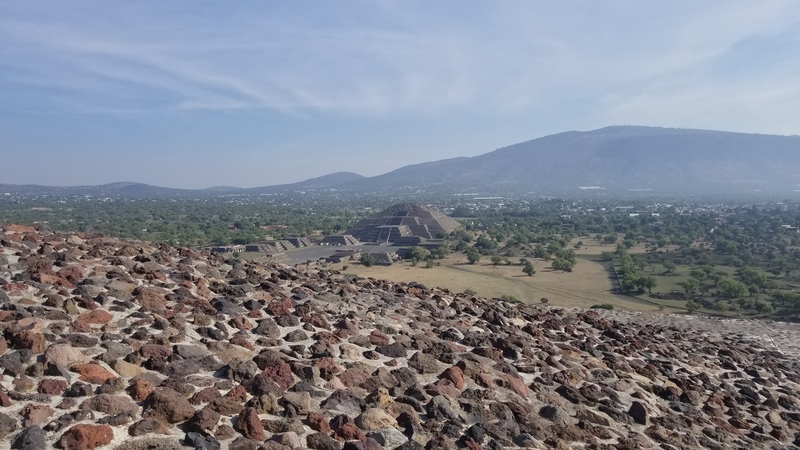 After taking the previous two photos, i decided to make my way down from the pyramid of the Sun, and start exploring over to the pyramid of the Moon. Going down the pyramid we walked in a zig zag fashion down the stairs. The way down was a bit more difficult in the sense that it is very steep, and if you descend in a zig zag fashion then there is nothing to hold on to. Also, by this point there was much more traffic coming up the pyramid so interference was frequent. Once we got to the bottom, we decided to begin our trek to the pyramid of the moon down the road of the dead. 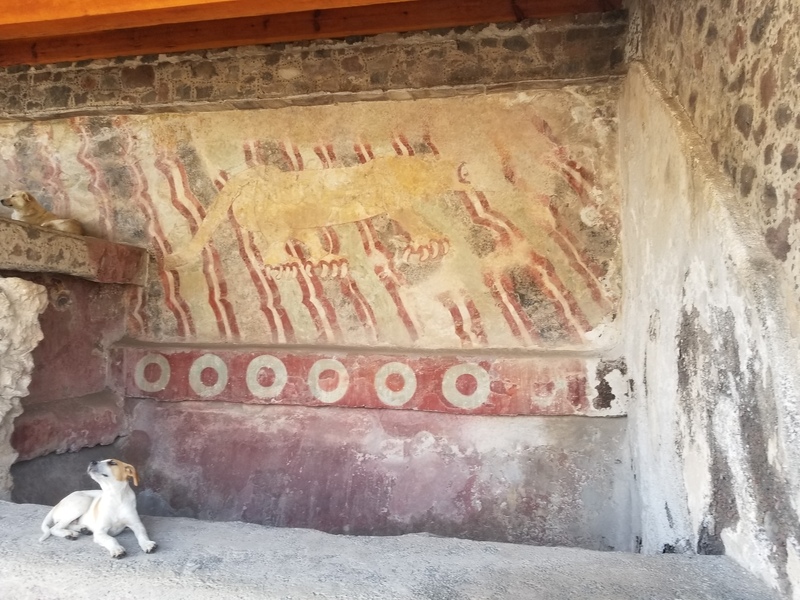 Not far into our walk, we see the only piece of artwork found at this archeological site which consists of a tribute to the Puma. This is the only piece of artwork at the site of Teotihuacan. It is suspected to be painted by the later residents that came well after the construction of the site. The speculation is based on dieties worshiped by the later residents. Still it is not known if the puma had any significance to the original builders. The area is sheltered so that the painting does not get destroyed by the weather. Due to being one of the few areas at the site with shade, many stray dogs are found that are trying to stay out of the heat. Temperatures in this site can reach 100° F easily. As we continue our trek on the road of the dead towards the pyramid of the Moon, we are being told that the later residents used this road as a means of trading valuables from the area; yet somehow i could not get out of my head that this road contained many individuals last steps before being sacrificed. The theory that the road was used for trading, is based on accounts from the later residents of the city. The same residents that very openly stated in their writings and historical documents that they had settled in a city that was built for the gods long before they had arrived. The buildings to the left and right of the road, are said to be temples dedicated to different gods such as the god of agriculture, god of water… so on. In this photo, you can see the base of what were once buildings alongside of this road called the road of the dead. As we move closer to the pyramid of the Moon, we are bombarded by locals selling all sorts of artisan art. One piece that attracted my attention was a puma made of pure obsidian. Unfortunately, i did not want to bring it back on the plane as i was trying to travel light. I regret not purchasing one, but perhaps i will on my next trip, as i typically travel to this city yearly. 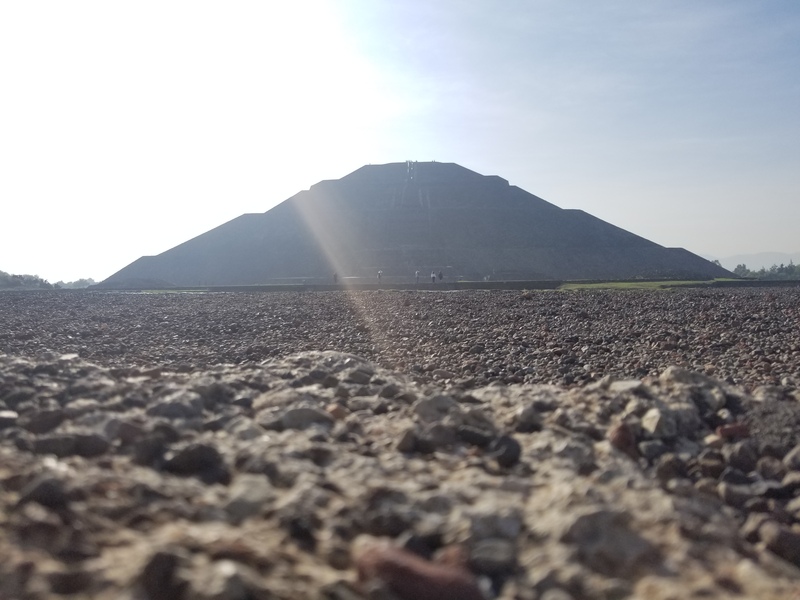 View of the pyramid of the Moon as we walk there on the road of the dead from the pyramid of the Sun. At this point the climate, altitude will fatigue most folks that are not used to the altitude or the heat, or the smog. Mexico city is a great city, it is amongst the most populated in the world. Due to the fact that it is surrounded by mountains, the high altitude, pressure, trap in the smog making it very exhaustive when tackling physical activities. With a temperature of about 94° F, we make our way to the pyramid of the Moon. The pyramid of the Moon is about 1/3 the size of the pyramid of the Sun. Regardless, it is an impressive sight. In front of the Pyramid there are two structures, one which reminds me of an altar. The pyramid of the Moon has much steeper steps on it, but the length of the stairs overall are much shorter. Unfortunately no one is allowed to climb all the way to the top on this pyramid, as there are loose stones and it becomes very unsafe. View from the first flat level on the pyramid of the Moon. This is the highest one is allowed to climb due to unstable rocks above. The main structure in the center of the square in front of the pyramid is believed to be an area for high ranking priests to address the citizens. In my opinion it could be what is assumed, but also, judging by the different colors seen on the structure, it could be the base or a home for someone of importance to the different structures surrounding the area, such as the minor temples to the God of Agriculture, God of water so on. This could be the area were the overseer of these other priests resided. Whether to address the crowd, or oversee the other priests it can only be speculated. The altar like structure (closest to the bottom of the above image) seemed like a place where human sacrifice took place. The cultures that occupied this site after the unknown builders left were known to exercise human sacrifice. However, modern archeology considers this to be an order of compass with long tradition in the area. 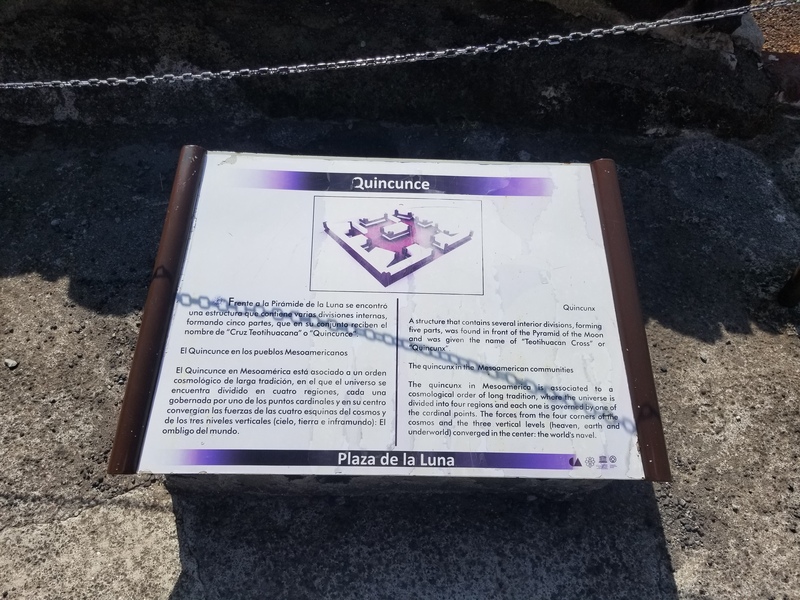 The description for the lunar plaza as understood by modern archeologists. Overall, the excursion to this site was very impressive. I was very saddened by the “common facts” frequently ignored by tv shows, documentaries, and even science websites when it comes to this site. Seems the only reality we have been taught about it, is what fits the agenda of the authors. The fact remains that we have only speculation, and absolutely no idea who built Teotihuacan to this day. The Aztecs, Mayans, Toltecs amongst many other cultures all spoke of arriving at a city that was built for the gods long before they arrived. They are called Teotihuacanos in honor of the sites name. Clearly, they did not have a clue who built it. We certainly do not. It was also a bit dissapointing realizing that the river of Mercury was nowhere near where all these documents, and TV shows stated it to be. Please do not misunderstand, we did not expect to get access to it, but we were certainly going to see if we could get a private tour somehow. We sadly were unable to accomplish this. Perhaps in the future on one of our other trips we could get in there and do a video documentary on this entire site, with a focus on the mercury river to the underworld. To the ancient cultures it is know that things that cause a reflection of images meant a passage to another dimension, or an underworld, depending on who’s history you read. Regardless, time will tell and hopefully we will be able to gain some insight into this amazing place. I absolutely recomend this site to anyone interested in Central American history. The sheer size of these pyramids is downright impressive. I’m surprised that we know so little about something that would have required such a massive man-force to complete. You would think that there would be plenty of documents that provide evidence of who, and when built these structures, but the reality remains that we speculate on everything, and know nothing of its creators. 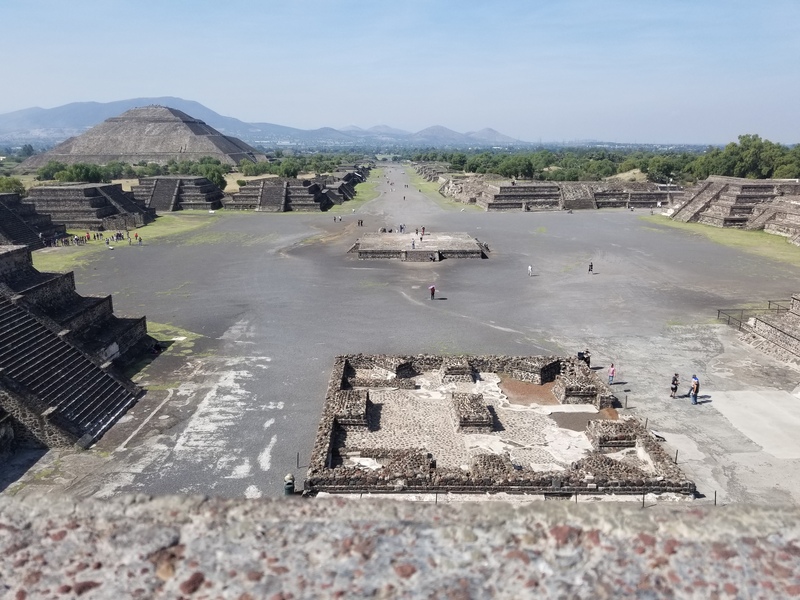 The only bits of knowledge come from the residents that came well after Teotihuacans creation… even those cultures state that they know nothing but that it was built for the gods.